Airport representatives of Marvel Adventure will greet you at Tribhuwan International Airport. You will be transferred to hotel. Introductory session will be held with our trekking guides and leader will brief about overall trip details. Overnight at Hotel. 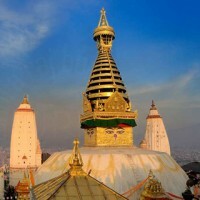 Various UNESCO WORLD HERITAGE SITES of Kathmandu like Swyambhunath, Kathmandu Durbar Square, Pashupatinath and Bouddhanath will be visited on this city tour day. Witness living goddess Kumari to Buddhists’ sacred pilgrim places and behold holy Hindu shrine. Final check will be done in terms of equipments, permits and TIMS before we get ready for tomorrow’s early morning flight to Lukla. Overnight at Hotel. 35 minutes of Scenic Mountain flight showcases numerous alluring landscape en-routes to Lukla. The journey can be full of anticipation and anxiousness as you will be landing at World’s Most Extreme Rated airport the Tenzing Hillary Airport. We meet our porters and Sherpa in Lukla. After brief stop we start our trekking. The trail encompasses suspension bridge, forests and villages before we reach Phakding. Overnight at Teahouse/Lodge. We cross altogether 5 suspension bridges on this day. We trek past places like Benkar, Manjo and Jorsalle. In Manjo we will enter the Sagarmatha National Park where our permits will be checked. Lunch will be on the way and we follow green lush forests environment, waterfalls and view of Thamserku and Kusum Kangaru mountains. The first view of Mt. Everest can be seen just about half an hour to Namche Bazaar. Overnight at Teahouse/Lodge. As part of acclimatization to adjust our body for high altitude walking we hike towards Everest View Hotel after breakfast. If weather is clear the majestic view of Kwangde and Thamserku can be seen from your accommodation place. We will take a sip of coffee in Everest View Hotel and witness panoramic view of mountains. Tabuche, Nuptse, Everest, Lhotse, Amadablam, Thamserku and numerous others can be seen. If time permits we can stroll around Khumjung Village or around various shops, eateries and bars of Namche Bazaar. Overnight at Teahouse/Lodge. The trail is roughly flat until Kyangjuma and descends to Phungi Thanga. We traverse uphill through dense green lush forests of rhododendron, pines and fig to reach Tengboche. Iconic Tengboche Monastery with gigantic Mt. Amdablam on backdrop mystifies our trip. Magnificent view of Khumbu Valley on either side is the feature of Tengboche. On a clear day you can view Everest too. Offer your prayers at monastery in evening and get good sleep. Overnight at Teahouse/Lodge. We trek past the village of Pangboche and Somare to reach Dingboche. We will start to notice the change in vegetation. Trees will start to disappear and we will see occasional bushes on the way. The sight of Amadablam will always be on our right hand side. Dingboche is relatively large village with few teahouses and lodges. Overnight at Teahouse/Lodge. Final acclimatization rest is done at Dingboche. We will climb to Nagarshan Hill (5100 m) or trek to Chhukung Valley to adjust our body. After hiking we will again come back to our teahouse and rest. After breakfast we will start our trek. We will walk in a valley surrounded by hills, Lobuche Peaks and Tabuche Peaks. We will take our lunch in Thukla then climb uphill until we reach Thukla Memorial. Witness various memorials of Everest summiteers that lost their lives during Everest expedition. Legendary mountaineers like Babuchhiri, Pashang Lhamu, Scott Fischer, Rob Hall and others’ memorial can be seen. The sight of Mt. Pumori is ever present during the trip until we reach Lobuche. Overnight at Teahouse/Lodge. We will climb Lobuche Pass and trek through moraines beside Khumbu Glacier until we reach Gorakshep. Walking on rocky rough terrain might be tiresome but heed instructions of trekking guide and walk meticulously. After brief stop at teahouse in Gorakshep we walk towards Everest Base Camp. Take as many pictures as possible in base camp. We will again return back to Gorakshep for overnight. Overnight at Teahouse/Lodge. Early morning we will start uphill climbing of Kalapathar. Majestic sun rising from casement of Himalayas and enlightening it with its rays is joy to watch. Whole body view of Everest, Lhotse, Nuptse, Pumori, Amadablam and numerous other mountains will make you feel worthwhile after enduring tiresome walking. After such spectacular phenomena viewing we trek downhill to Pheriche. This is small town opposite to Dingboche at foothill of Tabuche. Overnight at Teahouse/Lodge. Even if the trail is similar from where we ascended don’t overlook mountains and landscape. We would like to suggest you that during trip return time you will enjoy the most. As you descend altitude decreases and you will breath more easily as well as you will have great memories too. The scenery looks absolutely different while returning as well. We trek past Tengboche and reach Namche Bazaar. Overnight at Teahouse/Lodge. It’s joyous day of trekking. With an amazing memory of time spent in Everest Base Camp and its periphery on our head we will travel towards Lukla jovially. We will enjoy together including porters and support crew members in evening. Enjoy to the fullest with Nepali folk music, beverages and delicacies. Overnight at Teahouse/Lodge. We will formally leave Khumbu region today. 35 minutes of scenic flight will take us back to Kathmandu. You will be transferred to your hotel from airport. In evening team of Marvel Adventure will host a farewell dinner. We will exchange our memories and debrief about services offered. Overnight at Hotel. Our Airport representatives will drop you to International Airport. Marvel Adventure will always remember you as our family and with vow to serve you again we will bid you farewell. Nir (who runs Marvel Adventures) led an outstanding trek to Everest Base camp, Chola Pass and Gokyo Lake and peak that I went on. He's professional, highly safety-conscious, organised, and fun - can't recommend him highly enough. A trip with Nir is a trip in safe hands! Nir guided 5 of us on an unforgettable trip to Everest Base Camp, Chola Pass and Gokyo Lakes Region. He was outstanding - super professional, highly safety conscious, great fun to be around, very knowledgeable and full of very insightful advice. A trip with Nir is a trip in safe hands! 5 stars. Nir was our guide for the Annapurnna Circuit, which we completed this December (2018). 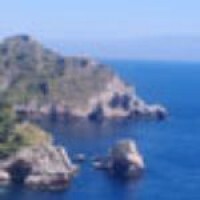 We had a fantastic time and would really recommend this trek.Nir was a very informative guide, nothing was too much trouble and he and the team really went out of their way to look after us. Especially making sure we ate well and looking after our health. He made sure the kitchen each night prepared fresh food and no-one had any stomach trouble (something which can't be said for many of the other hikers we met). We felt in good shape for the big day hiking over the pass and we were confident of making it over with Nir as the guide. Kumar was a great co-guide, very cheerful and Anup, Mr Lok and Prem were really great porters. So helpful and always with big smiles despite trekking while carrying so much stuff.Thank you so much! 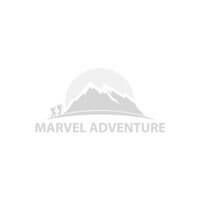 I have just completed the Everest Basecamp with Marvel Adventure and Nir and it was nothing but awesome! I’ve enjoyed every minute of the trek and could advise anyone to do it, even in Monsoon! Up near the camp we have had beautiful scenery of the Himalayan peaks and there were almost no tourists on the way to the top during this season! Nir is very knowledgable and experienced, he pays attention and gives advice on what to eat and what not, when and where to rest and acclimatize - he even made sure we could watch most of the worldcup games!Thank you Nir for a very good trip and the (marvel) adventure of a lifetime! The best adventure to Gokyo Ri! What an amazing experience we had!! I can’t recommend Marvel Adventures enough if you are thinking about doing a trek through Nepal! We felt so lucky to have had Nir as our guide to Gokyo Ri, not only does he have a wealth of Information he was one of the funnest guides to have! He truly made our experience so memorable and we honestly can’t wait to come back and trek again. If you are thinking of doing EBC I would highly recommend to do Gokyo Ri instead as the views are by far the best in Nepal! Nir worked so well with us and I’m glad to have met him as we now have a friend for life! Thank you for our adventure and for a wonderful experience! Everest base camp + Chola pass extension, Amazing!! What can i say, absolutely fantastic experience from start to finish! myself and my partner decided to trek base camp and the chola pass, what an amazing time we had. Our guide Nir was a wealth of knowledge throughout the trip. Always prepared to go above and beyond to accommodate anything we needed during the trek. A high level of professionalism and knowledge was constantly provided, even when i felt ill due to the altitude i was taken care of. I could not have asked for a better guide, the tea houses were excellent and i felt that Nir became a friend that i felt i had known for years! the trek itself was amazing, stunning scenery and memories i will treasure for a lifetime! these guys are professionals at what they do and i would not have wanted to travel with anybody else. thanks again. I recently completed a trek to Upper Mustang with Nir as our guide. Nir organised the whole trip from arrival in Kathmadu until the time we left. Nothing was overlooked. Our hotels and tea houses were all of a high standard and meals provided were excellent. Nir always responded to our queries and requests within hours and his knowledge of the area and Nepal was excellent. He quickly assessed our fitness and ability and there was flexibility in the itinerary at all times. I would highly recommend Marvel Adventure to organise and guide you through any treks in Nepal. I trekked ABC with Marvel Adventure - an adventure that surpassed all expectations both for scenery and the fantastic organisation done by Nir and his team. They made it all so easy from the planning to the organisation of the trek. I would definitely recommend Nir and Marvel. 100%.